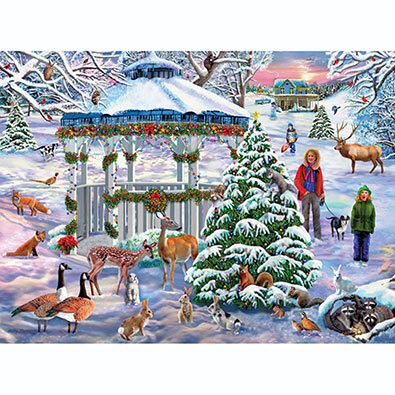 Holiday Gathering is a 1000 piece jigsaw puzzle designed by artist Mary Thompson. The animals and birds of the woods have gathered to enjoy the holiday decorations and tree lights at the gazebo. A family smiles in astonishment at the fantastic sight. Available in two-piece counts.